Linus' Blog: Paleontologist Discovers "Giant Kraken Lair"
Article first published as Paleontologist Discovers "Giant Kraken Lair" on Technorati. 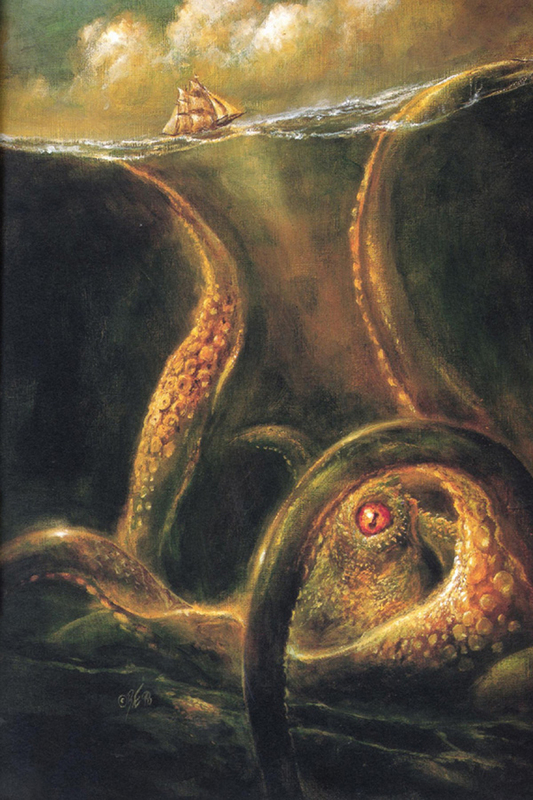 A kraken is a giant , octopus like, creature. It is famous for their parts in films where the kraken takes down ships and drag them into the ocean. “Pirates Of the Carribean “ is one example where the mighty kraken has been used to take down Captain Jack Sparrow. The mythical kraken might not have been around long enough to be spotted by men but it very well may have been able to feast on large dinosaurs. Mark McMenamin believes that a real live kraken may have lived in the ocean long before humanity was born. While Mark was investigating the fossilized remains of some ichthyosaurs in the Berlin-Ichthyosaur State Park in Nevada, he saw that the bones were rearranged in a organized way which is common behavior for octopuses. But an octopus as we know it can’t rearrange or kill a 45-foot-log ichthyosaurs so it had to be an ancient predecessor, the mythical kraken. McMenamin said: "I think that these things were captured by the kraken and taken to the midden and the cephalopod would take them apart".Mark’s theory is that the kraken took their prey with their sucker disc arms and drowned them by taken them underwater. McMenamin’s theory will be hard to prove but he and his team of researchers are very confident in their work.